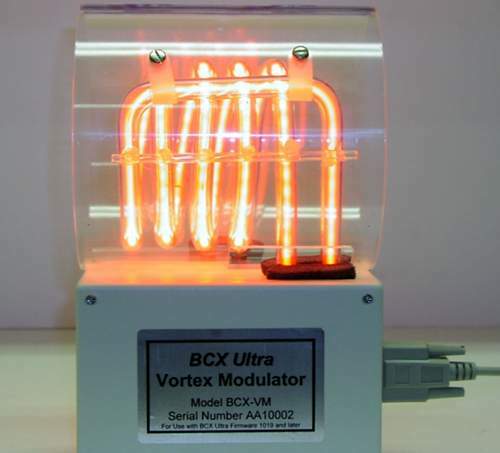 We now have a stand-alone Beam Tube known as the BCX ULTRA Vortex Tube. The number one reason for making this unit available for people, who simply want a stand-alone tube, is because Royal Raymond Rife had one. Others have asked for a stand-alone Beam Tube, because they just want to set it up and run it, while they are working, like Doctors, who are doing paper-work, is a good example. The BCX ULTRA Vortex Tube certainly doesn't take-the-place of the hand-held Ray Tubes for which we are FAMOUS! As you remember, the hand-held Ray Tubes COMPLETE the circuit through the body forcing ALL of the energy through your body and so they are VERY EFFECTIVE. For some time, we had planned on doing what Royal Rife did with his Phanatron Beam Tube. His tube was in the 50 watt range and it was used for SPECIFIC areas of the body. It would either touch the body or be held just-off the body. The Phanatron Beam Tube was used to pan the area of a tumor for an example. Our engineer and a lighting engineer talked about the Phanatron Beam Tube vs. the BCX ULTRA Vortex Tube, that the lighting engineer had developed. The BCX ULTRA Vortex Tube is directional, so that it CONCENTRATES the energy MORE in one spot, while the Phanatron Beam Tube is MORE all-directional from tests, that our engineer had done. The Phanatron Beam Tube is made from Quartz Glass, which allows the U-V rays to pass through the glass. Our engineer didn't want us to take the RISK of someone DAMAGING their eyes with TOO MUCH U-V and so we opted to go with the Vortex Tube for these 2 reasons. We are VERY HAPPY with it! It is MORE for FULL-body and NOT for SPECIFIC areas like the hand-held Ray Tubes are. You can even put your hand or arm into the BCX ULTRA Vortex Tube. Seeing MORE Photos Of The BCX ULTRA Vortex Tube, Then Please CLICK HERE. Seeing The BCX ULTRA Frequency Instrument, Then Please CLICK HERE.